Manager’s Agenda #3. Transmitting Communication from Louis A. DePasquale, City Manager, relative to the appropriation of $120,000 from Free Cash to the General Fund Executive Department Other Ordinary Maintenance account to support the cable television license renewal process. The only thing I’ll say on this is to note just how little leverage we have in any of this. It’s not just that Comcast is the only game in town. Just as bad is the fact that the United States Congress some time ago gutted the previous regulations governing the granting of Cable TV franchises by municipalities. The only thing we can even discuss/bargain is PEG – public access, educational programming, and government programming – and we can’t even do much with those. We can’t even discuss what stations should be in the basic Cable TV package. Manager’s Agenda #4. Transmitting Communication from Louis A. DePasquale, City Manager, relative to the appropriation of the Massachusetts Department of Energy Resources (DOER) Clean Energy Resiliency Initiative grant in the amount of $78,300 to the Public Investment Fund Water Extraordinary Expenditures account which will support Phase I of the Cambridge Water Supply Resilience project. I’m always interested in hearing about what new projects are planned for protecting and improving Cambridge water whether or not it’s related to "resiliency". Manager’s Agenda #17. A communication transmitted from Louis A. DePasquale, City Manager, relative to Awaiting Report Item Number 18-79, regarding a report on the Grand Junction Overlay District. Manager’s Agenda #18. A communication transmitted from Louis A. DePasquale, City Manager, relative to an agreement with the Cambridge Housing Authority to take an easement and accepting the conveyance of a 2nd easement for the purpose of constructing a multi-use path along the Grand Junction Railway and to provide grant funding to assist in closing the funding gap for the Millers River Redevelopment Project by paying for part of the demolition of the community center building, reconstruction of a new community building, renovation of 15 housing units and the creation of permanent affordability restrictions for these units. Applications & Petitions #2. A Zoning Petition has been received from Joseph T. Maguire of Alexandria Real Estate Equities, Inc. Transmitting a proposed amended to the zoning ordinance by creating the Grand Junction Pathway Overlay District adjacent to the Grand Junction railroad right-of-way between Binney and Cambridge Streets. There’s something happening here. What it is ain’t exactly clear. In any case, it’s nice to see some tangible progress on this project that we first proposed as part of the Green Ribbon Open Space Committee about two decades ago. I’m still curious how it would connect with the Somerville Community Path.. 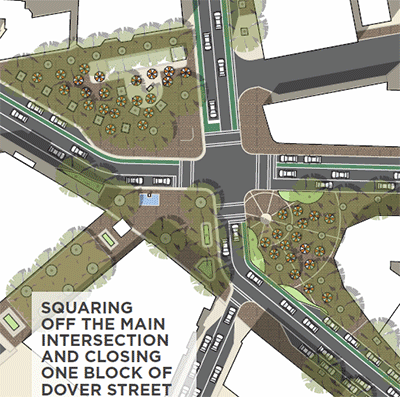 Check out the draft of the Davis Square Neighborhood Plan. Many of us still remember when a railroad ran through the middle of Davis Square. Anyway, what we do affects Somerville and vice-versa. Envision That. Pretty soon the whole city is going to smell like Woodstock – only at 20X the potency. Flat Roof Zoning returns for another try. You know – Up On The Roof. Will this again get lost in the shuffle? I know a guy who can help with the amendments. The relentless campaign to reimpose rent control piecemeal continues like death by a thousand cuts. Last year’s jewel was the "Right of First Refusal" that fortunately never saw daylight. Now this. Though the order asks for a legal opinion on whether Cambridge can impose such a financial requirement, it should be obvious to any sentient city councillor that they cannot do so without authority from the Commonwealth. Committee Report #4. A communication was received from Paula Crane, Deputy City Clerk, transmitting a report from Councillor Sumbul Siddiqui, Chair of the Economic Development and University Relations Committee, for a public hearing held on Oct 3, 2018 to discuss a City-based Cannabis Social Equity Program and Policy Order #10 from June 25, 2018. While I agree that this potentially lucrative business should not be dominated by the usual high-rolling entrepreneurs and that economic opportunity should be spread far and wide, I find unconvincing (to say the least) the notion that anyone should be provided an advantage based on ethnic identity. Committee Report #5. A communication was received from Donna P. Lopez, City Clerk, transmitting a report from Vice Mayor Jan Devereux, Chair of the Government Operations, Rules & Claims Committee, for a public hearing held on Nov 14, 2018 to discuss the Policy Order adopted regarding Cambridge publicly financed Municipal Election Program and the Cambridge Municipal People’s Pledge Program. I wish I had been able to attend this meeting because I could go on for hours on this topic. For starters, I am not at all convinced that money is any longer the limiting factor in municipal elections. I will also note that most or all of the proposals floated seem pretty obviously chosen to advantage political friends or to disadvantage political opponents – even though the case is always framed in terms of "leveling the playing field". I have in previous discussions of these matters also pointed out how publicly financed municipal campaigns might perversely work in the context of proportional representation and organized candidate slates. This is conveniently overlooked by proponents. If there are future meetings on this topic, please try not to schedule them when I’m in the classroom teaching because I would really like to take a few people to school on this topic. Committee Report #7. A communication was received from Donna P. Lopez, City Clerk, transmitting a report from Councillor Dennis J. Carlone and Councillor Craig A. Kelley, Co-Chairs of the Ordinance Committee, for a public hearing held on Nov 15, 2018 to continue discussions on the petition filed by the City Council to amend the Zoning Ordinance as it relates to cannabis uses. The disaster in Lawrence and the surroundings: and all they can ask about is trees? Really? How about this: due to mis-information from a single sensor, a large region experienced catastrophic gas pressure levels. How are eversource’s systems different? It took about 30 minutes from the high pressure levels on the mains, to a response in shutting them down. Again how would eversource’s response be different?